In the bowl of a stand mixer, combine flour, salt and sugar. Add in cooled mashed potatoes, butter and cream and combine thoroughly. Heavily flour a countertop. Using about a golf ball-size piece of dough at a time, place ball on floured countertop, press to flatten with your hand and flour the top of the dough piece. Using a floured rolling pin, roll out piece of dough until very, very thin (about as thin as a tortilla). Using a bench scraper or pizza cutter, cut rolled out dough into a rectangle shape, about 5 x 8 inches. Place rectangle on a plate and cover with a piece of parchment paper (lefse cannot touch each other or they'll stick together, so make sure you put a piece of parchment paper between each layer). Repeat steps 2 and 3 with the rest of the remaining dough. Head a large griddle or frying pan to medium high heat. Grill each side of the lefse until light brown spots form, about 1-2 minutes each side. Place on another plate, separating each piece with parchment paper (like above). Serve warm with fillings of your choice. 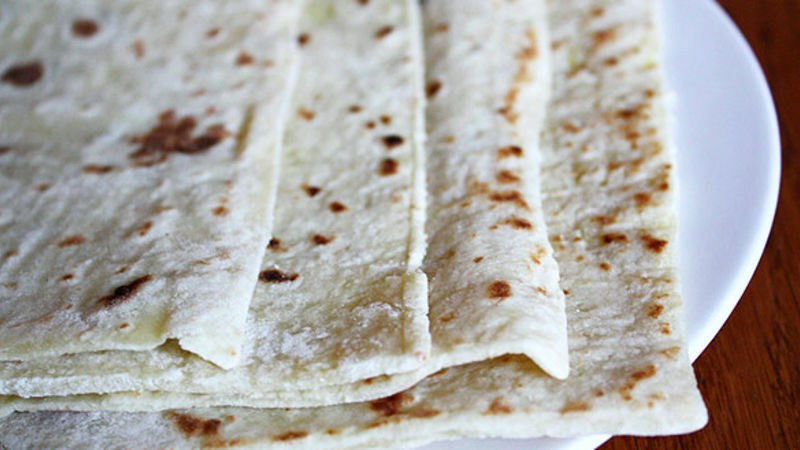 Lefse is like the tortilla of Northern Europe. Made with potatoes, flour and a dash of cream, it’s dense but thin, mildly sweet and an excellent conduit for a variety of spreads. In case you hadn’t guessed by my post on Pretzel Rolls, I’m German. Okay, false – I’m American, but of German descent (my grandparents came straight from the motherland, and still retain their brash accents and gastronomic customs). Everyone on both sides of my family is German, down to the spouses and even some pets (if a name defines a pet’s cultural roots). That is, everyone except my husband, who is Swedish. Going to college in Minnesota, land of 10,000 lakes and many a Swede, I’d grown rather accustomed to “uff-das,” Sven and Ole jokes and lutefisk. There was even a guy on campus whose car was painted like the Swedish flag, and the inside of the car was equally decked out, down to Swedish flag pillows on the seats. For real. So meeting and marrying a Swede from Minnesota wasn’t much of a surprise to me. What was a surprise was the food he loved to eat. Though he shared a common aversion to the infamous lutefisk, he held one Swedish food near and dear to his heart: lefse. And until I met him, I’d never had the pleasure of partaking in this Swedish (actually, Norwegian, but close enough) culinary treasure. Though traditionally eaten warm and rolled up with butter and sugar glazed on the inside, my husband and I have taken to eating lefse in a variety of ways. Our favorite? The lefsedilla – two pieces with melted cheese inside. It is Oh. So. Delicious.